I'm much more into pies and pastries than I am into cakes. There's not much in the world that's more perfect than a (good) apple pie with vanilla ice cream, and my love for warm-weather pies knows no bounds, including cool weather. However, pies are a bit of a pain - making dough, rolling it out, fitting it into a pan, and then handling whatever process the filling calls for. After all this, a standard 9" pie pan only serves eight good-sized slices. In this past summer season of cookouts and parties, that would have had me making three or four pies to serve just part of my extended family. The solution, it would seem, is to simply make bigger pies - this way, you still do everything once but yield 30-50% more deliciousness, and it's really not any harder to roll dough out to ten inches than to nine inches. I've found that one of the easiest ways to bake large quantities of dessert - as well as lend a nice-looking uniformity to the table - is to use a 10" springform pan or pastry ring in place of your usual pie or cake pan. This gives the pies straight, elegant edges, and makes them look more professional (when you order a piece of pie at a restaurant, it's often cut from a 10" - or larger - straight-sided pie). I like to cut mine into 16 pieces, which allows party guests to go easy on dessert, or to try a couple of different flavors. 10" springforms are available everywhere, and often for very little money. Pastry rings are harder to find and a little pricey for what you get, but they're handy to have around. A pastry ring in a 1-3/8" height is the perfect substitute for a deep-dish pie plate. To adapt a 9" pie recipe to a 10" pan, just multiply everything by 1.33. You can fiddle with the proportions a little - for instance, I normally only multiply the crusts by 1.25. To fit a crust into a pastry ring, roll it into a 13" circle, place it on a parchment-lined cookie sheet or pizza pan, and fold over the edges of the dough. Place the pastry ring around the dough, and then fold the dough back out, placing it up the sides. Cut off most of the excess at the top, and let the tiny bit of excess remaining (an eighth of an inch or so) rest on the rim of the ring. Of course, let the dough chill before baking. Your baking time may increase a little - usually no more than 25% or so - so watch it carefully the first time you adapt a recipe. The other upside of baking this way is that the pies transfer beautifully to platters and cake stands. To transfer a pie, allow the pie to cool, then run a sharp paring knife along the inside of the pastry ring. Slide the pastry ring off the pie. Make sure the pie is entirely cool before moving it. 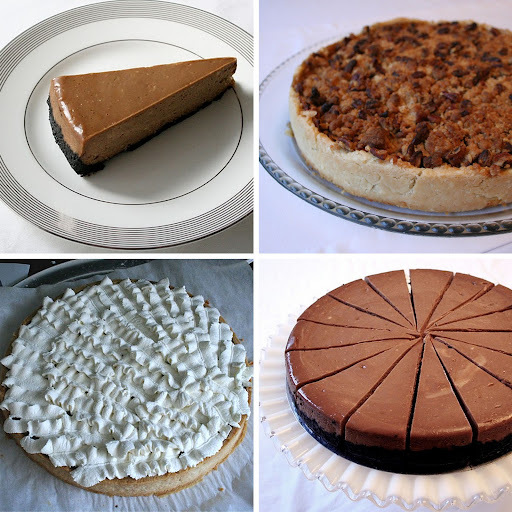 (For transferring the key lime pie, I usually freeze it for a half-hour or so; for a chocolate cream pie - shown at the bottom-left, above - I pour the ganache into the crust, allow it to set completely, and transfer it to a plate before I pour in custard filling.) Once the pie is totally cool, use two offset spatulas to slide it onto a plate, or for an easier time of it, use a cake lifter (this tool comes in so handy). If you use a springform pan, you can just display the pie with the pan's bottom still under it. In a food processor, pulse graham crackers until crumbs are fairly small - or put the graham crackers in a plastic bag, and use a rolling pin to crush. Add melted butter and powdered sugar and mix until all the crumbs are moist. Press mixture firmly into a 10" pastry ring set on top of a parchment-lined cookie sheet. Bake in preheated oven for 10 minutes, or until firm and slightly darkened. Place on a rack to cool. With the whisk attachment of an electric mixer, beat egg yolks and zest on high speed until fluffy and light yellow, about 3 minutes. Add the condensed milk and half the lime juice, and stir just until blended. Add the remaining juice and stir just until blended, scraping the bottom of the bowl. Pour into the crust. Bake in preheated oven for 21-22 minutes, until filling is only slightly jiggly. (I often insert a candy thermometer in the middle to ensure that the temperature has reached 165F degrees). Place on a rack to cool. Refrigerate cooled pie at least two hours before serving. Whip the cream in a chilled bowl until soft peaks begin to form, then add sugar and vanilla. Peak until stiff peaks form. Garnish slices of pie with whipped cream to serve. Oh, one more thing... Where, pray tell, can I find the recipe for the pumpkiny-cheesecakey?-chocolate-crust looks-like-it's-straight-from-heaven pie? It's for a 9" springform, but you can easily bump it up to 10" - just multiply by 1 1/3! If you want it to be creamy, place a pan of water in the oven on the rack below. This has become my sister-in-law's birthday cake. I hope you enjoy it!